Running in Hyrule fields for the first time in the game. Yet another one of those games which changed the way we though about videogames from 2D to 3D. There’s a lot to say about this game. If you’ve seen Egoraptor’s video about Ocarina Of Time vs. A Link To The Past you know what I’m talking about. And infact I’m going to repeat some of the things he said in that video, and say my opinion about them. 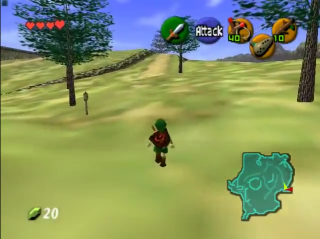 Zelda Ocarina Of Time is the first 3D title of the Zelda franchise. But seriously, what it gained in graphics, it lost in feelings. Why do I say this? Well because what Egoraptor says it’s true; in part. A Zelda in 3D isn’t bad, the problem is that it doesn’t feel the same as the others that came before. The Zelda series was conceived to have an adventure in an unknown world were you had to explore and figure out things on your own, with little help from the game. While in modern Zelda games, you’re given many more directions, the game is more guided than it was before. Take a look at Zelda Skyward Sword for instance (which I played and almost 100%’ed) where you even get the ability to use your sword as a point-and-follow device to guide you to your next location. That works ok as a way to search for hidden items, but not to guide me to the next location! It feels like the game is taking me on a tour! But then again, I’m not saying Skyward sword is bad. It sure has more cons than pros, but the idea of a strength meter and a shield gauge were really nice if you ask me. I also liked the flying bug and the whip items. But apart from that, Skyward Sword didn’t really stand up to the other Zeldas. 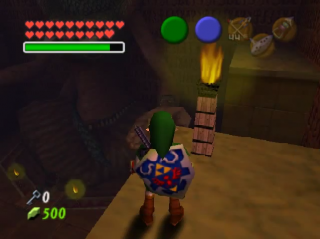 Zelda Ocarina Of Time has yet another problem. It’s really slow paced. Egoraptor said that Ocarina Of Time has a lot of “waiting” involved, and he isn’t wrong. First of all, dialogue is slow. Second, to explore an area you need to get the item you need there and know why you need to go there by going through a series of step that completely stop your will to explore further. Third, most enemies are fought via the pattern of “wait until the enemy is vulnerable, then attack”. Link as an adult during the second-to-last dungeon. Everything he said is right. But we need to remember that this was the first 3D Zelda to be ever programmed. Of course those things happens when you approach a new system of development. But look at Zelda Majora’s Mask. It is smoother, faster, you’re less guided, and after the story is over, there’s still so much more to do (if you didn’t know, Majora’s Mask is known to be the game with 30% story and 70% sidequests). And in those sidequests you need to figure out things on your own, with a little help from an in-game notebook. I think Majora’s Mask fixed some problems Ocarina Of Time had, and that’s why I prefer Majora’s Mask over Ocarina Of Time. But overall, Zelda Ocarina Of Time isn’t that bad. It’s still enjoyable to its end, trust me. When I first played it, I got addicted to it. For real. It’s one of those games you’ll remember forever.